Safety comes first no matter what and that is especially valid for motorcycle riders. Motorcycles are much more exposed to accidents in traffic and the reason is fairly obvious. Safety is important and it all starts with getting a proper helmet. There should be no compromises when it comes to quality and reliability but there are several types of helmets and each type has its own pros and cons. Today we will have a look at full face modular helmets. They are the most popular type mainly due to their utility, design, and ease of use. One common misconception is that full face modular helmets were made for smokers. That is a false assumption. They were made to offer comfort and convenience. The helmet can be flipped up to be open-faced which offers a simple way of getting a breath of fresh air. Regular full-faced helmets need to be taken off and that is much more annoying. Modular helmets are not meant to be used open-faced when riding. Instead, they were made to be easy to flip up, have a conversation or take a break and get some air. The only downside of this type of helmet is that it does not have the same structural strength as regular full face helmets. They are still a much better option than riding without a helmet at all. Also, most regular helmets have a dual visor system. One can be clear while the other acts as a sun visor. Sadly they are not particularly cheap but on the flip side, there are hundreds of different models to choose from. We selected 10 of the most popular full face modular helmets that offer a good balance between safety, quality, and price. 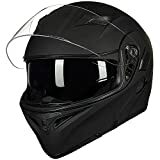 Without any further ado here are the top 10 best face modular helmets in 2019. 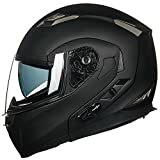 Which Full Face Modular Helmet To Pick? 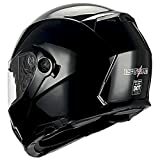 Hawk ST 11121 8GB is a cheap and safe option for any rider. 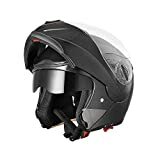 The model is made using a composite thermoplastic shell with an aerodynamic shell which also means that it is a good pick for the ones that like higher speeds. 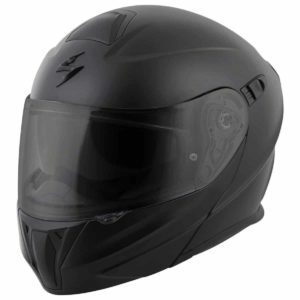 The model has a dual visor system has upper and lower chin vents to improve airflow on the inside. Since it is a modular helmet, the face shield can be flipped up and also has an open face position. The model is available in multiple sizes and only in a glossy black color. ILM modular full face helmet is a great, inexpensive product that offers safety and comfort at the same time. The helmet is made from a hard ABS shell and an adjustable strap. The interior is padded with a soft foam which is removable, making it easy to clean. For this particular model, the manufacturers made it available in 7 different colors. As for the visors, they are anti-scratch, anti-fog. The helmet has a clear visor and an additional one to block the sun. 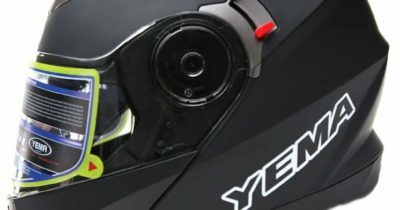 Yescom full face modular helmet manages to offer really good protection for the price. It is a DOT approved product which means that it is compliant with all the safety regulations. The model has two flips-up visors and air vents that make it much more comfortable to wear. Last but not least, the interior padding is removable which makes it easy to clean. Also, it is available in 5 different colors and 3 sizes. The helmet itself is very comfortable to wear but with one condition and that is getting the right size. The inner padding is thicker than expected which means that it will be too tight. 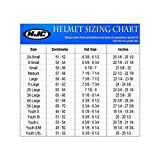 To avoid getting an unwearable helmet it is better to look at bigger sizes and avoid having to return the product. ScorpionEXO EXO-GT920 is a premium model that offers excellent levels of safety and comfort. It has a soft inner padding using an anti-microbial fabric that is completely removable and safe to wash. The helmet was made with a dual density system that provides better energy displacement. As expected it has dual visors. The sun visor and the clear one are retractable and were designed to be anti-scratch and have an anti-fog coating on both surfaces. 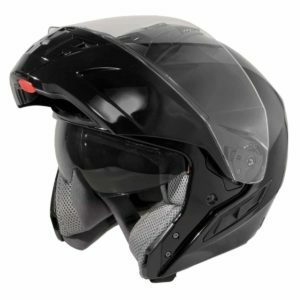 For such a great helmet that comes with a rather steep price, one would expect it to be rather quiet. Sadly, the design of the helmet makes it quite loud when it comes to wind noise. It is not a deal breaker but it is something that should not have been a problem for a product in this price range. 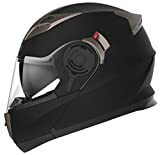 The 1Storm full face modular bike helm is a good pick for the ones that are looking for something simple and effective. 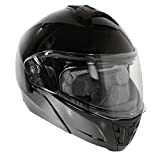 It is a DOT approved helmet with dual visors and a durable thermoplastic shell. The interior is padded with a soft material that can be removed and machine washed. It is a good model for rides around the city due to its modular design. 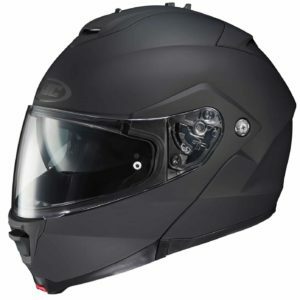 Besides the classic glossy black model, the helmet is available in several other colors as well. The glossy black version is probably the worst when it comes to maintenance. It gets dirty quite easily and fingerprints are very visible. Things are better with their other models but they are still glossy and still get dirty but it is not as visible. ILM offers several different modular helmets but their Bluetooth integrated version is the one that scored highest on our list. 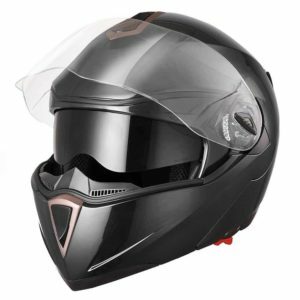 The model offers the freedom to answer calls without taking the helmet off due to the built-in Bluetooth module. It was designed to meet or exceed ECE and DOT safety standards and it is quite comfortable. Like with all other full face modular helmets, the model has a clear and a sun visor. One interesting design problem is the way the visors are placed. They do not offer a perfect seal which means that it lets air enter the helm. This causes wind noise to be more noticeable. It can be quite annoying and it is unexpected for a product in this price range. 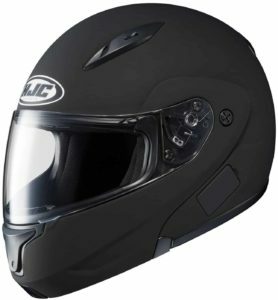 HJC IS-MAX is a great helmet from the premium range. Its construction makes it one of the safest picks. The model is made using a polycarbonate composite shell with an adjustable chinbar. The inner liner is soft, offers great support and can be removed. To improve comfort, the helm has been fitted with vent holes to keep the humidity down on the inside of the helm. The visors are standard but there are additional models available and the helmet itself is available in 7 different colors. Compared to other models from the same brand, sizing for the HJC IS-MAX is a bit off. The helm feels smaller than expected and might be a bit too tight for some. Fortunately, the helmet is available in multiple sizes and some might be better off getting one size larger. 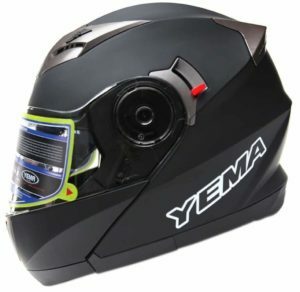 YEMA YM-925 offers a great balance between performance and price. It is a mid-range modular helmet with dual visors and air vents placed on the top. The shell is made out of a durable ABS material while the interior is soft and can be removed, making it easy to maintain clean. Also, the helm is large enough to offer room inside for the user to have a Bluetooth headset and even a pair of glasses on. A bonus feature is the fact that the interior ventilation can be adjusted so that the rider experiences as much comfort as possible. The foam used for the padding is quite interesting in the sense that it is rigid and hard at first. This accounts for a tight fit in the beginning but things change after a while. Wearing the helmet for a few hours causes the foam to soften up and it only gets better with time. 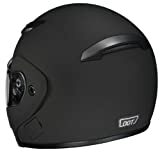 HJC CL-MAXBT is a great helmet for the ones that like to be mobile and hate taking off their helmet to answer a call. It has a built-in Bluetooth headset and surprisingly it is not that expensive. The model uses an advanced polycarbonate shell that offers superior protection and it features a special visor that offers a 95% U.V. protection. Last but not least, the helmet has a channeling ventilation system that takes air from the front and flushes it in the back. When the vast majority of modular full-face helmets have two visors, the HJC CL-MAXBT decided to have just one. 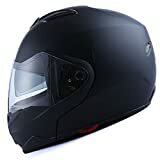 The helmet has just a clear visor which is fine most of the times but it can be annoying when taking a ride early in the morning and the light from the sun makes things very difficult. 1Storm full face modular helmet is by far the most popular and appreciated model on our list. 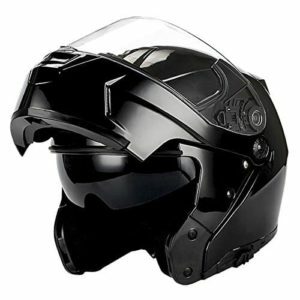 The helmet is inexpensive and very well constructed. It has a dual lens design with the inner one having a smoked tint to block sunlight. The model is made out of a durable polycarbonate shell and a soft inner padding that can be removed in order to be cleaned easier. In terms of safety, the helmet is DOT approved while comfort is much better than with other helmets. When the helmet is new and barely used, the inner padding will feel a bit hard, making it a bit tight. It gets better as the helmet is used as the foam becomes softer and it starts to fit better and feels more comfortable. 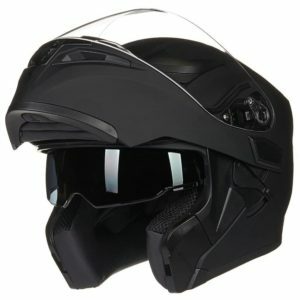 Full face modular helmets usually have standard designs and there is not much of a difference between them. From a pricing perspective, they have a wide range but there are some key aspects to take note about that might not seem important but they actually matter a lot. 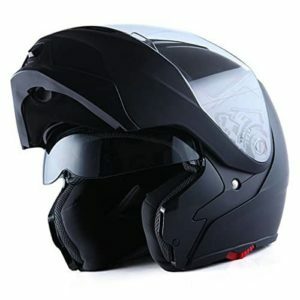 Safety is the most important factor and something that got many different modular helmets not to make it into our list. Safety: As mentioned, safety matters a lot. A reliable helmet should meet or exceed safety standards. Usually, most reliable helmets are DOT approved. Venting: Not everyone likes helmets that have air intakes. They do improve comfort as they keep the interior cool but they also add a bit of air noise. In some cases, the noise levels are quite loud. Sizing: Not every manufacturer follows the same standards in terms of sizing. Some manufacturers actually have rather inaccurate or misleading size charts. They usually also offer the dimensions of each model size.